Nighthawk Custom, known for its work in custom 1911s, decided to add another classic John Browning design to its lineup: the Browning Hi Power. This classic design offers perfect balance, size and fire power, with an impressive 13-round magazine capacity. According to the company, its efforts have improved accuracy, reliability durability and aesthetics in the time-tested Hi Power design. The pistol features hand texturing on the slide top and rear of the slide. The frame and trigger guard are hand-stippled, and the gun is built with a custom extended beavertail and a contoured magwell. 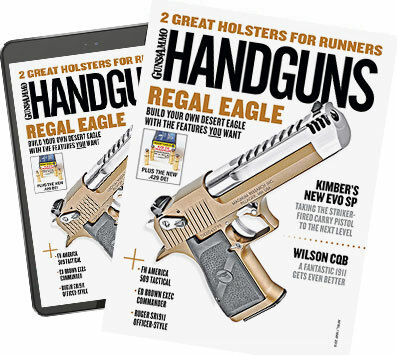 The magazine release features 25-lines-per-inch serrations. For the sights, Nighthawk used a Heinie Slant Pro black rear sight and produced its own 14k gold bead front sight for the pistol. The barrel is crowned and Nighthawk used a competition steel hammer, improved sear lever and an improved trigger. The trigger features a custom No. 4 crisp trigger job. The gun itself is finished in a rust-resistant satin Cerakote finish. It comes with custom select Cocobolo checkered grips finished with the Nighthawk logo and two 13-round magazines. The Nighthawk Custom Hi Power is available now at a suggested retail price of $2,895.